In the 19th century, thousands of poverty-stricken Italians left their homeland. 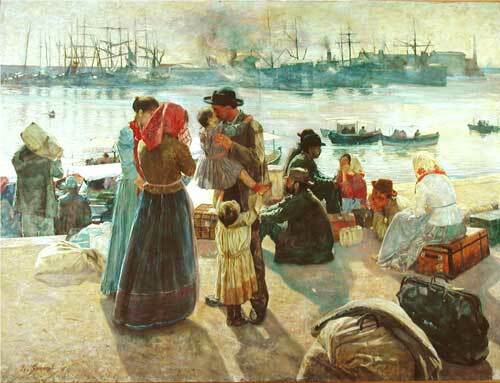 This painting portrays a group of emigrants leaving the port of Leghorn (Livorno) in Tuscany. A group of townsfolk from Leghorn were among the first Italians to arrive in New Zealand, responding to New Zealand agent John Glyn’s enticing advertisements. They were not prepared for the hard labour that awaited them, and the experiment failed. Italians settled much more successfully once their own migration chains began.